Corporate Governance |JFE Holdings, Inc. The JFE Group comprises a holding company and three operating companies—JFE Steel, JFE Engineering and JFE Shoji Trade. JFE Holdings, a pure holding company at the core of the Group’s integrated governance system, guides Group-wide strategy, risk management and public accountability. Each operating company has developed its own system suited to its respective industry, ensuring the best course of action for competitiveness and profitability. The holding company and operating companies individually and collectively strive to maximize corporate value for shareholders and all other stakeholders. JFE Holdings and each operating company has an Audit & Supervisory Board Members. The companies are crosschecked by the Board of Directors, which supervises operational execution, and the Audit & Supervisory Board Members, which conducts audits. Also, a corporate officer system separates decision making and execution to clarify authority and responsibility, as well as to accelerate execution. JFE Holdings’ Board of Directors is responsible for maintaining and improving management efficiency and passing resolutions as legally required, laying down key management policies and strategies and supervising operational execution. The Audit & Supervisory Board oversees management for the purpose of strengthening its soundness. JFE’s governance system has been strengthened by reinforcing fairness, objectivity and transparency with the aim of continuously increasing corporate value and profit for shareholders. In June 2017, the structure of the Board of Directors and the Audit & Supervisory Board was revised based on the Board's Effectiveness　Reviews. Accordingly, the President of JFE Engineering Corporation, the President of JFE Shoji Trade Corporation and two outside members (Director and Audit & Supervisory board member) have been appointed to the Board. For more details regarding our corporate governance, please refer to the JFE GROUP REPORT (Integrated Report), first published in FY2018. We elect Independent Outside Directors with the aim of composing one-third or more of the Directors by Independent Outside Directors. Independent Outside Directors will be elected from persons who are appropriate to bear the responsibility of strengthening governance such as those who possess abundant experience as management in global enterprises or experts who possess profound knowledge and satisfy our independence standards. Currently, of the eight Directors, three are Independent Outside Directors. More than half of the Audit & Supervisory Board Members are from outside. Independent Outside Audit & Supervisory Board Members will be elected from persons who are appropriate to bear the role of enhancing the auditing function such as those who possess abundant experience as management in global enterprises or experts who possess profound knowledge and satisfy our independence standards. Currently, of the five Audit & Supervisory Board Members, three are Independent Outside Audit & Supervisory Board Members. "In October 2015, JFE Holdings set up the Nomination Committee and the Remuneration Committee as advisory bodies to the Board of Directors to secure fairness, objectivity and transparency in the appointment of and remuneration for Directors and Audit & Supervisory Board Members. For both committees, the majority of committee members are Outside Directors/Audit & Supervisory Board Members and the chairs are chosen from among these people. The Nomination Committee reports to the Boardof Directors on matters related to CEO succession, selection of the Representative Directors and other Directors with special titles, and the nomination of candidates for Outside Directors and Outside Audit & Supervisory Board Members. Five meetings were held in FY2016. The Remuneration Committee discusses matters related to basic policies on executive compensation for JFE Holdings as well as each operating company and also reports to the Board of Directors. Two meetings were held in FY2016." "Directors and Audit & Supervisory Board Members are provided with opportunities and funding to receive training in legal matters, corporate governance, risk management and other subjects that help them fulfill their roles and duties. In addition, a briefing is held for Outside Directors and Outside Audit & Supervisory Board Members prior to Board of Directors meetings. Furthermore, Outside Directors and Outside Audit & Supervisory Board Members are provided with relevant information and opportunities to exchange opinions with the president and other top managers, attend key hearings on the operational status of individual departments, and inspect domestic and overseas business sites and Group companies." "Executive compensation is based on the basic policies founded on discussions and reports by the Remuneration Committee, and it is decided through either a resolution of the Board of Directors or deliberations by the Audit & Supervisory Board Members, for an amount within the total limit approved at the General Meeting of Shareholders. For more details regarding exective compention, please refer to the JFE GROUP REPORT (Integrated Report), first published in FY2018." "Since FY2015, JFE Holdings conducts questionnaires and interviews to each Director and Audit & Supervisory Board Member based on the introduction of our Basic Policy on Corporate Governance, and evaluating the overall effectiveness of its Board of Directors. Please review the Corporate Governance Report for more information." "JFE companies are responsible for business decisions in accordance with their respective rules and procedures, whereas JFE Holdings makes decisions about Group-wide matters. Each operating company determines key matters through a deliberative process by its own Management Committee and Board of Directors. 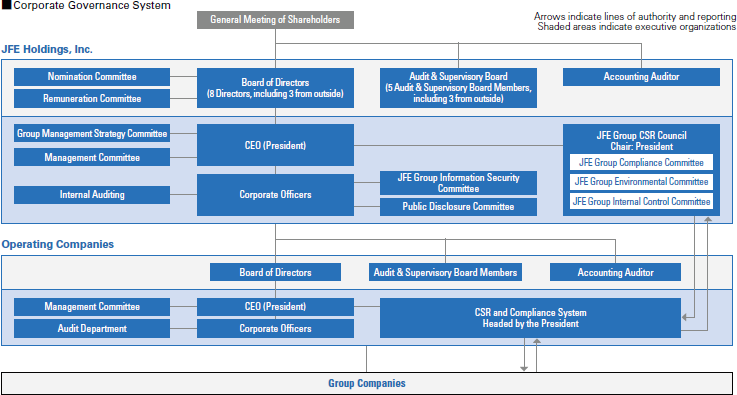 In April 2017, JFE Holdings changed the operating structure of key committees. Management strategies involving the entire group are now deliberated by Group Management Strategy Committee and core issues of JFE holdings, the operating companies and the Group are deliberated by the Management Committee before they are submitted to the Board of Directors for resolution." The JFE Group’s internal control system, in accordance with the Basic Policy for Building Internal Control Systems, is maintained through various committee regulations including the Rules of the Board of Directors, Regulations for Group Management Strategy Committee, Regulations for Management Committee, Regulations for the JFE Group CSR Council, Regulations for Organization and Operations, Regulations for Document Management, Regulations for Addressing Violence Directed at Companies, and the installation of Corporate Ethics Hotline. The Basic Policy for Building Internal Control Systems is revised and improved from time to time to boost sustainable corporate value. JFE Holdings, its principal operating companies and key Group companies had internal audit organizations. These organizations share information to enhance overall auditing within the Group. Internal audit managers of operating companies serve concurrently as internal audit managers of JFE Holdings for stronger ties within the Group. "Audit & Supervisory Board Members attend meetings of the Board of Directors, Group Management Strategy Committee and Management Committee as well as other important meetings. To audit how Directors execute their responsibilities, they conduct hearings with Directors and corporate officers regarding operational status and receive operational reports from subsidiaries. In addition to undergoing statutory audits, JFE companies take the following initiatives to ensure the effectiveness of internal auditing by the Audit & Supervisory Board Members and to strengthen coordination among the Members." Audit & Supervisory Board Members have been appointed, including JFE Holdings. Operating company personnel are dispatched to Group companies as part-time Outside Audit & Supervisory Board Members. Each absentee Audit & Supervisory Board Member serves four or five subsidiaries to raise the quality of the audits by their Audit & Supervisory Board Members and enhance Group governance. The JFE Group Board of Auditors includes both full-time auditors of each Group company and absentee auditors. Subcommittees and working groups created to address specific issues meet autonomously throughout the year to share information, research issues and enhance understanding. 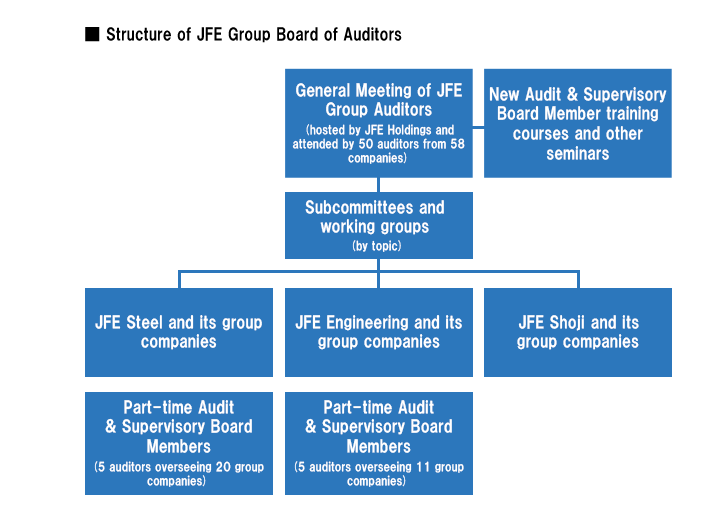 The findings are presented at the general meeting of JFE Group Auditors and used for audits. The Audit & Supervisory Board Members held scheduled or unscheduled meetings with JFE’s outside accounting auditor, in which the latter presented its audit plan, completed work and detailed results. The firm also presented a detailed explanation of its quality management system to confirm its validity. In turn, the Audit & Supervisory Board Members explained their own audit plans and other matters to the firm. The two sides also shared opinions on related matters. Some Directors, corporate officers and Audit & Supervisory Board Members of JFE Holdings serve concurrently as Directors or Audit & Supervisory Board Members of operating companies to strengthen governance and information sharing across the Group. To strengthen governance, JFE Holdings managers attend each operating company’s General Meeting of Shareholders and Management Planning Briefing, receive reports on their activities and discuss the managerial policies of subsidiaries.